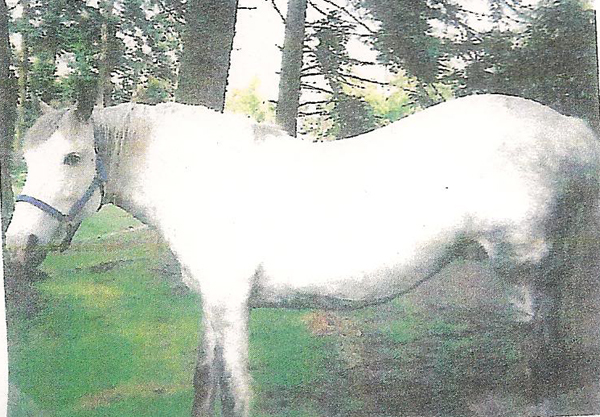 Charmeon was rescued from a PMU farm by her original owner, who had her for five years before a severe financial upheaval caused her to have to give up her horses. 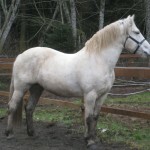 Charmeon’s owner cared a great deal for this mare, and even sold her furniture and other possessions to pay for two months of training to get her started under saddle. As a SAFE horse, Char was initially placed into a home as a “husband horse” to a man who wanted to do competitive trail riding with her. Unfortunately, Char had shown a tendency to use her size to bolt away when being led, and she escalated that behavior in her new home. Heartbroken, her adoptive family asked to return her to SAFE, and because we had experienced the bolting ourselves, we elected to take her back. She was immediately sent back into training for a refresher course with Andrea Lucianna, and Char soon figured out that she could not pull that particular trick on an experienced handler! 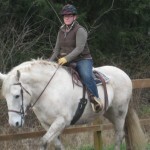 Char passed her retraining with flying colors. Then an amazing opportunity came her way. 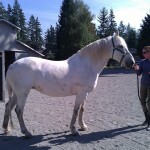 Helga Roberts, owner and head trainer at Dutch Mills Farm, offered to foster Char and continue her training. Char moved to Dutch Mills Farm in October 2012, and Helga began singing her praises since the day she arrived. 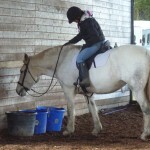 Char was given an amazing opportunity to be part of a barn family, and even carry one of Helga’s students to victory in a dressage schooling show. When Helga came to the realization that her life would not be the same without Char in it and asked to adopt her, we were overjoyed. Sadly, Helga and Char would only enjoy a short time together. 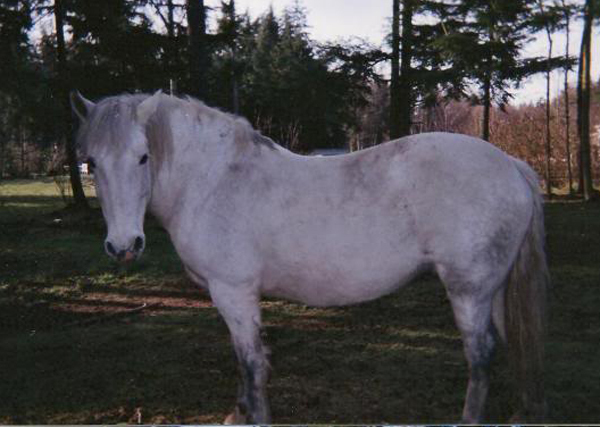 In 2013, Char was lost to colic; a heartbreaking end to her story. We are comforted knowing that she left this world surrounded by people who loved her dearly. But it was too soon to say goodbye. 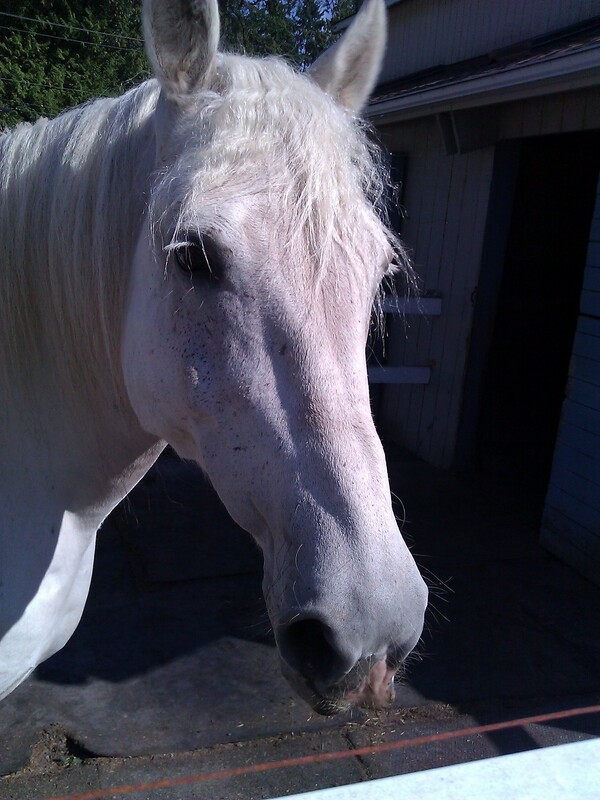 Our hearts are aching this morning as we say goodbye to an amazing mare, taken from us far, far too soon. 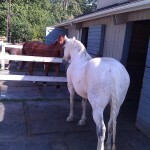 Last night, adopted SAFE horse Charmeon was lost to colic. She fought so hard, and every effort was made to help her pull through, but in the end, her beloved friend and owner Helga had to let her go. We are heartbroken for Helga and her daughter Anna‐Lynn who loved Charmeon so much and who deserved many, many more years together. It feels so unfair to lose Charmeon just when her life had reached such perfection. 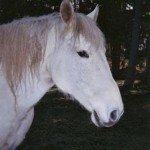 It hurts to have to tell you of her passing just five months after we happily announced her adoption. The picture of Anna‐Lynn holding up her blue ribbon while proudly sitting atop her lovely white horse will still bring a smile, but there will be tears as well. 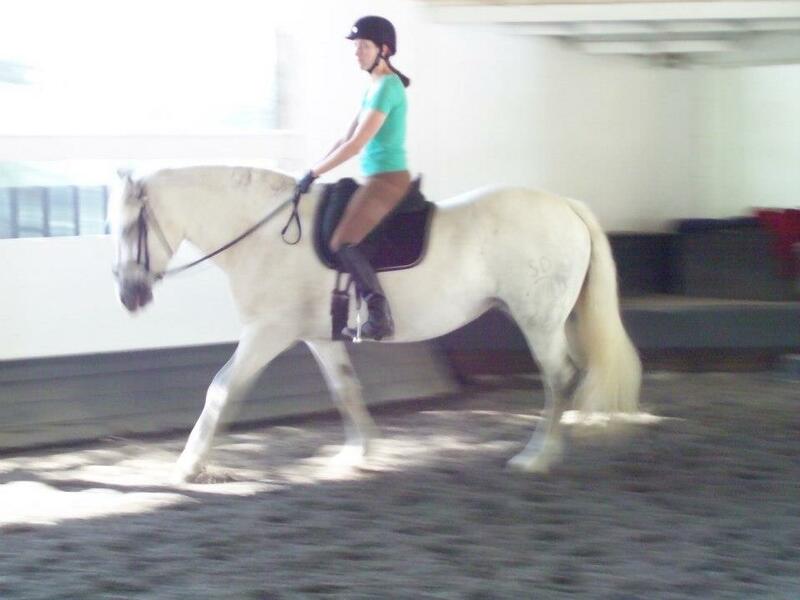 We won’t forget the joy we felt seeing Charmeon and Helga together in the Dressage arena or hearing Helga’s students talk about their amazing rides on this horse, but we’ll have to settle for memories instead of dreams now. But one dream we had for Charmeon did come true and it does bring us comfort: she did find her forever home, and she did know what it was to be loved completely and unconditionally. 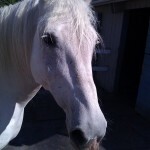 And for that we are so grateful to Helga…for recognizing the connection she shared with this horse, for honoring that connection, and for making an unbreakable commitment to her because of it. 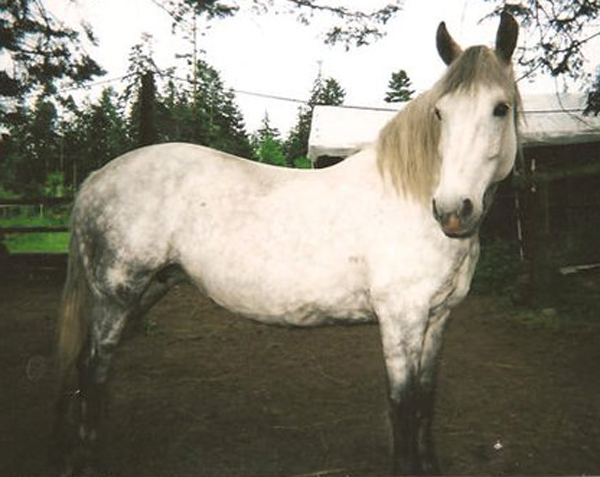 Helga and her family are feeling tremendous grief and pain at the loss of their horse, but only because they loved her so much. Rest in peace, dearest Char. The world is a little smaller without you in it. If you’re a fan of Dutch Mills Farm on Facebook (and if you’re not, you should be!) then you already know the incredible news that we have for you today: Charmeon is adopted!! Congratulations and a huge, happy thank you to Helga Roberts, who came to the realization that her life would not be the same without Char in it. We are overjoyed that Char has found herself such a wonderful home, and we look forward to witnessing the many happy years that she and Helga will have together. 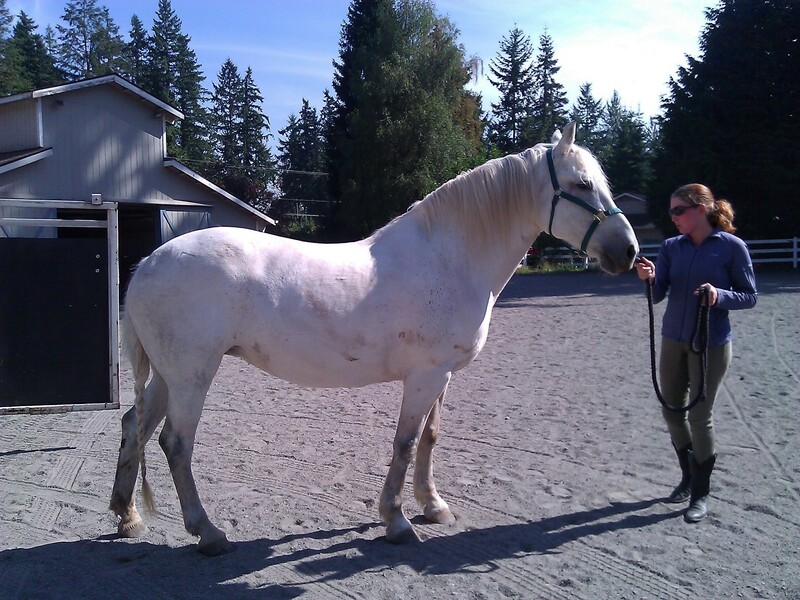 Adoptions like this one make us look back in wonder at the road that each horse took on its journey to its forever home. 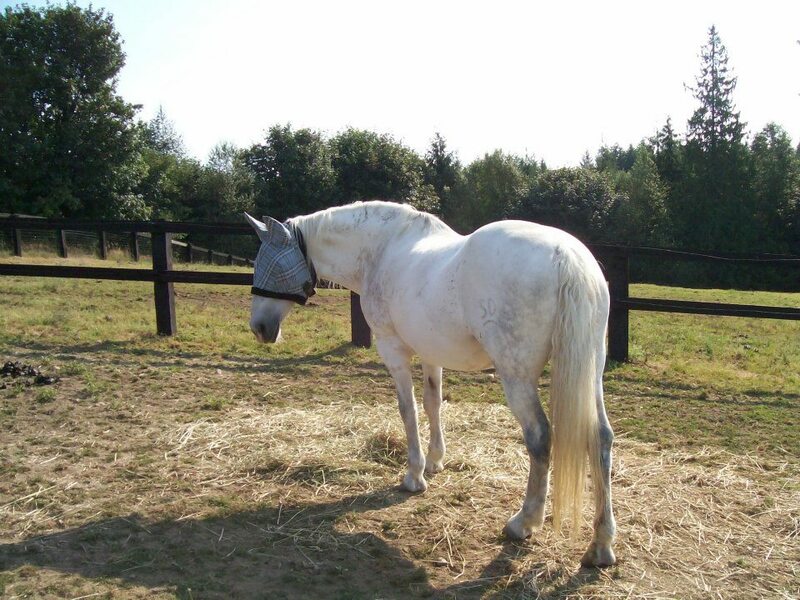 Charmeon was rescued from a PMU farm by her original owner, who had her for five years before a severe financial upheaval caused her to have to give up her horses. 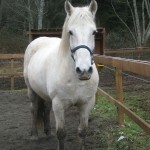 Charmeon’s owner cared a great deal for this mare, and even sold her furniture and other possessions to pay for two months of training to get her started under saddle. 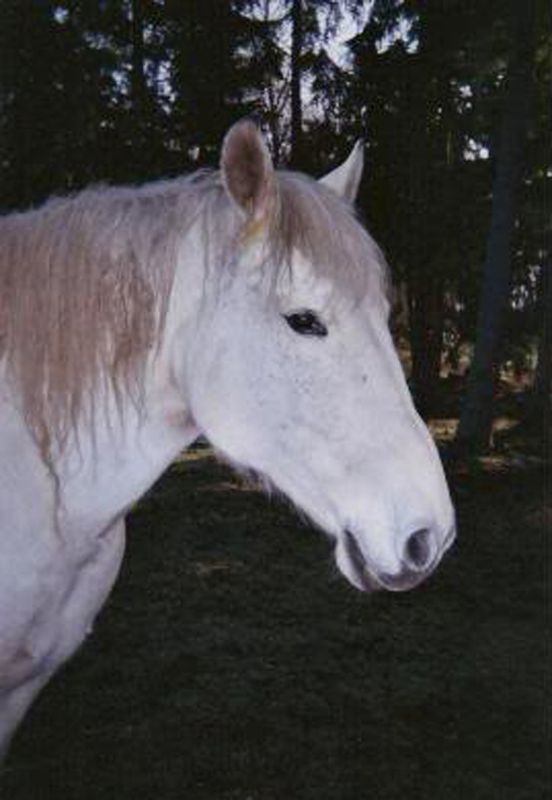 As a SAFE horse, Char was initially placed into a home as a “husband horse” to a man who wanted to do competitive trail riding with her. Unfortunately, Char had shown a tendency to use her size to bolt away when being led, and she escalated that behavior in her new home. Heartbroken, her adoptive family asked to return her to SAFE and because we had experienced the bolting ourselves, we elected to take her back. She was immediately sent back into training for a refresher course with Andrea Lucianna, and Char soon figured out that she could not pull that particular trick on an experienced handler! 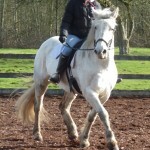 Char passed her retraining with flying colors. Then an amazing opportunity came her way. 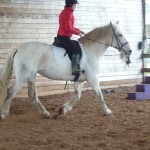 Helga Roberts, owner and head trainer at Dutch Mills Farm, offered to foster Char and continue her training. Char moved to Dutch Mills Farm last October, and Helga has been singing her praises since the day she arrived. 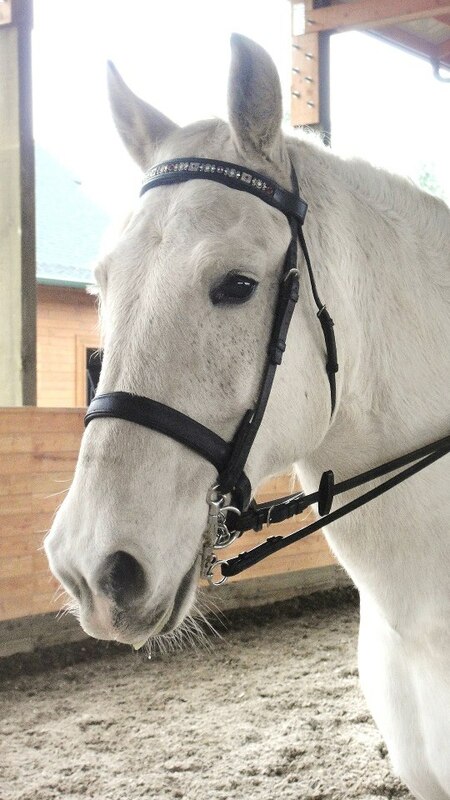 Char was given an amazing opportunity to be part of a barn family, and even carry one of Helga’s students to victory in a recent dressage schooling show. There was a fair amount of interest in Char, and a few showings, but the right adopter never quite appeared. SAFE Adoption Manager Sara Hall summed it up best when she commented, “At one of the first showings I did up there with her, I remember thinking to myself that Char had already picked her person. Funny how it works out that way, isn’t it?” As it turned out, Char’s person is Helga. All of us at SAFE wish Char and Helga the very best! We got this very exciting update from trainer Helga Roberts at Dutch Mills Farm who has been working with Charmeon. 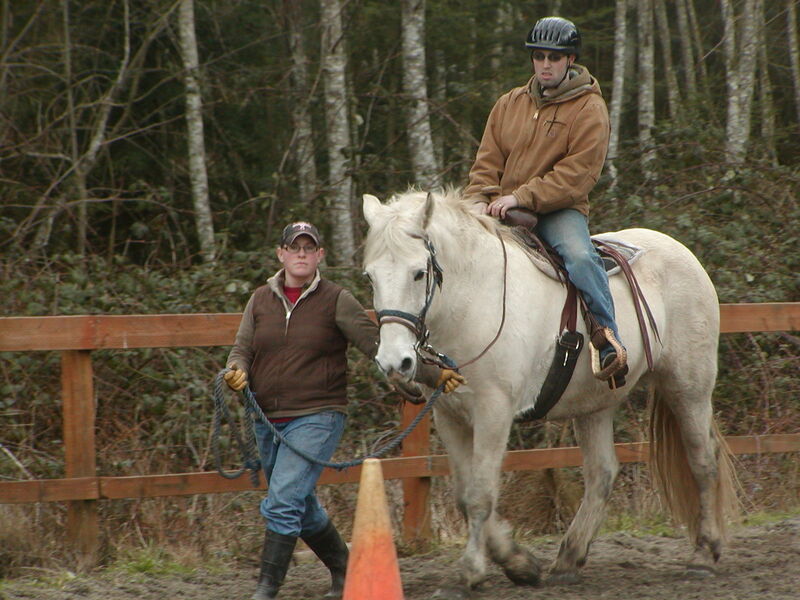 We are so lucky to have an amazing horse pro like Helga who is willing to donate her time to helping our horses! Char is making terrific progress — see for yourself! 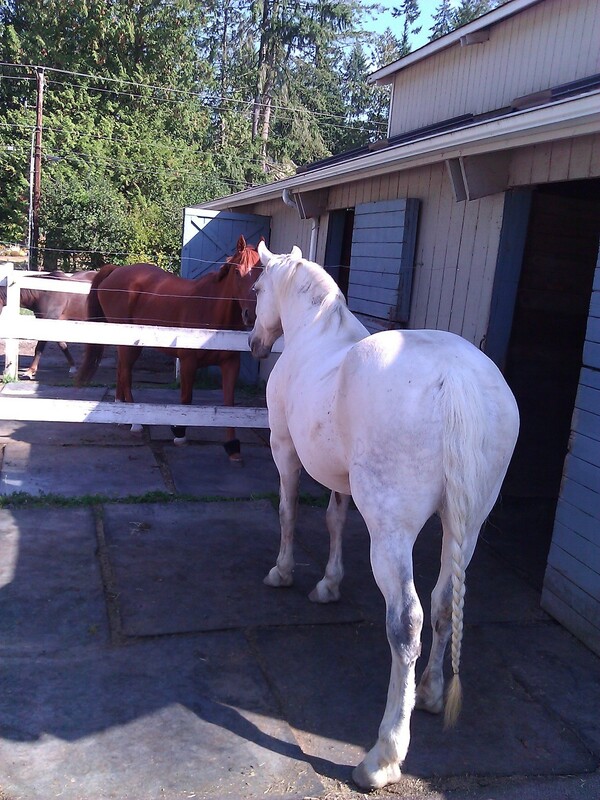 Miss Char is doing very well and is quickly becoming a barn favorite. 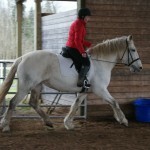 She is working in the arena, on the flat as well as over small jumps. 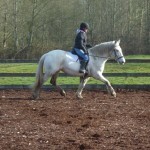 Her steering is getting better every ride and her canter has come a very long way! She is very willing and seems to like the work…she is easy to catch and usually meets me at the gate when it is time to get to work! She has had a bath and although she didn’t love the water all over she never did anything naughty; she let me wash her mane and tail and even the bubbles all over her back wasn’t an issue! 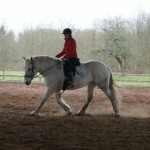 I felt she was rather insecure under saddle when she first came, but that has totally changed. 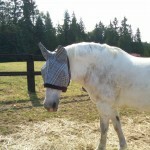 She is rather comfortable and is very secure in the decisions she wants to make in the arena!! 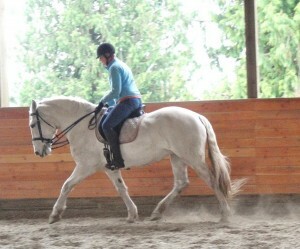 If you let her, she will trot two fast laps each direction and be done! 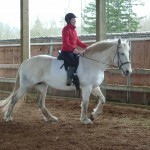 But when you let her know there is more, she is willing to go along with your idea, she picks up a canter easily (most days) and even though it is not the most beautiful canter, it is 3 beats and rather comfortable. 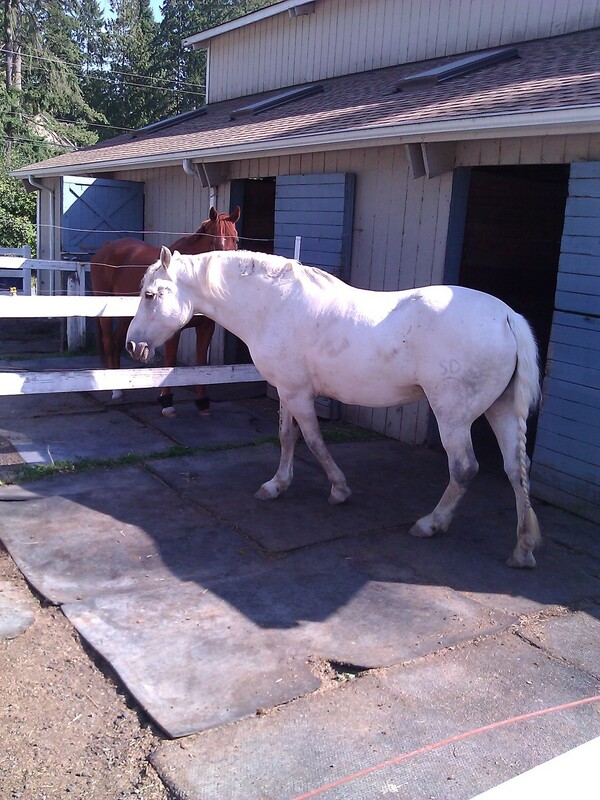 She is good with other horses in the ring (this made her a bit nervous at first) and stands still by the mounting block. Her previous behavior of bolting is something we really haven’t seen here at all, she has a plain halter on and hasn’t needed a chain. 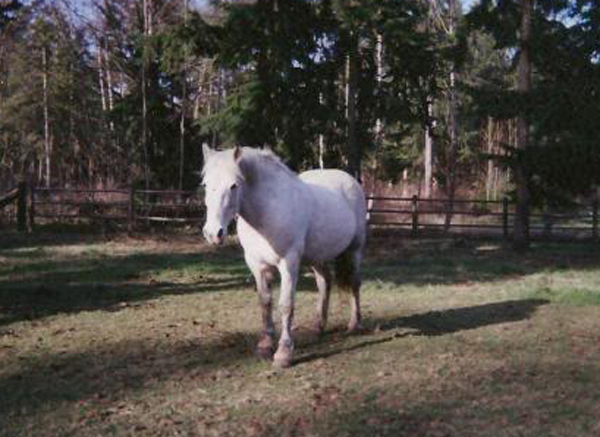 She stands fairly well for the farrier and even with a loose horse flying by her she stood quietly on the end of the leadrope. 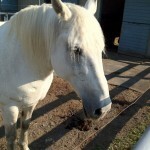 All in all a great horse to work with, super self‐secure and not herd bound at all! I think that Char is certainly ready to be adopted out to someone who is looking for a nice girl like her. 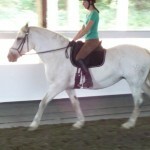 I think she can easily be handled by an intermediate rider and I believe will make anyone a nice horse. Updated to add some more pictures taken on the day Char arrived! Thank you, Sara!! SAFE volunteer Allison visited Charmeon up at Half Trak Farm and got to take her for a spin. 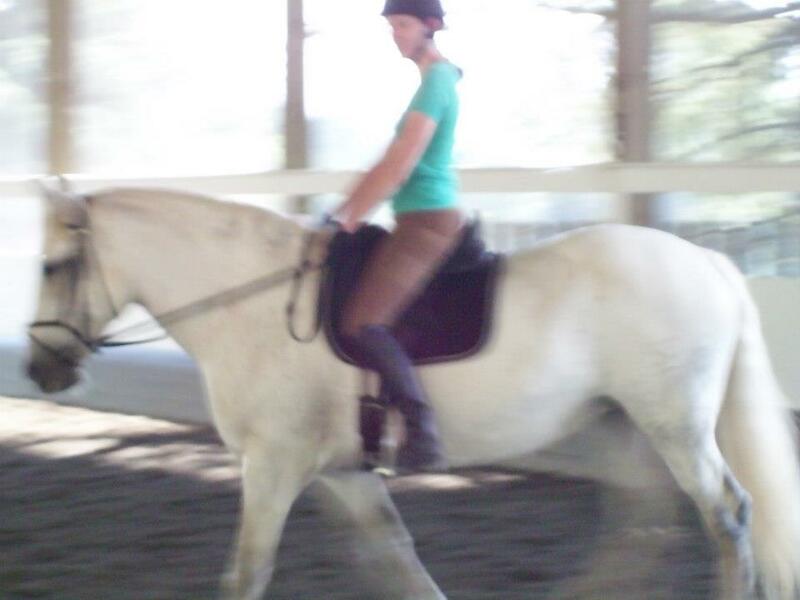 She reports that Char is pretty fun to ride although she’s still a bit green and lacks confidence. But she’s forward and sweet, and loves to hear that she’s a good girl. Thanks for the pictures, Allison! 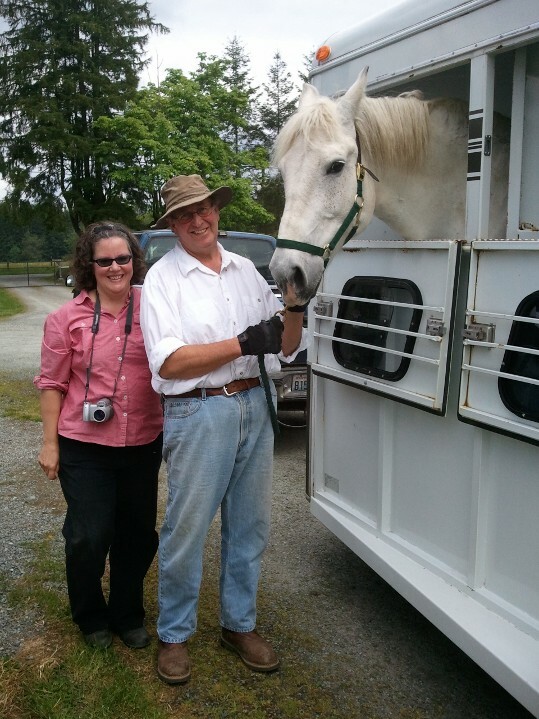 Congratulations to Peter and Helen J. of Port Orchards, WA on their adoption of Charmeon! 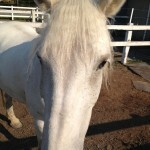 Char will be Peter’s trail horse. 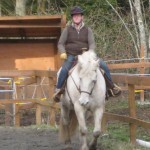 Peter has been a course designer for the ACTHA and now he is thrilled to finally have a horse to compete with, as well as to ride with his wife Helen, who is a lifelong horse owner. Char will join their 3 horses, two of which are retired, plus their mini donkey, on their beautiful small farm (Helen is a farm planner). 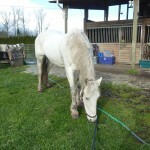 Char is a 16h, 14 year old Percheron cross mare. 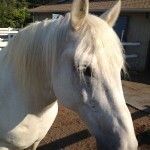 She is a former PMU mare that was surrendered by her owner in March 2011. To read Char’s history, click here. 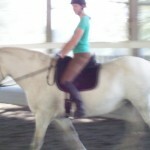 Charmeon is green broke and best suited for an intermediate or above rider. 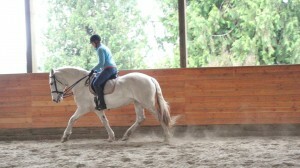 Charmeon is a very nice mare with good conformation and a beautiful, floating trot. 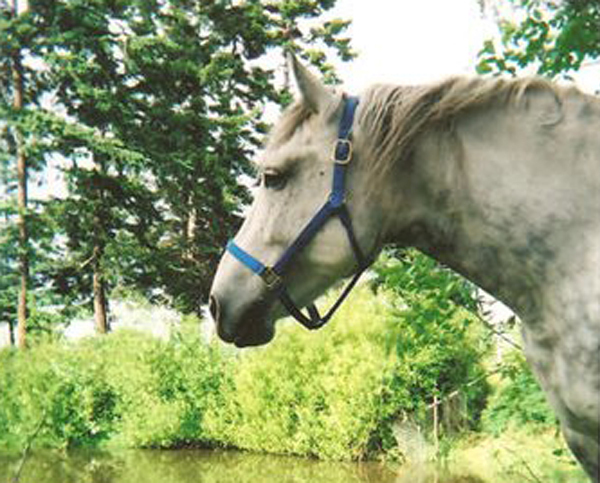 She was rescued by her owner from a PMU farm. 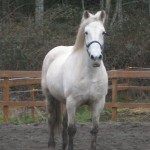 Her owner was facing serious financial problems, had lost her job and her farm, and sold furniture and possessions in order to be able to send Charmeon into training. 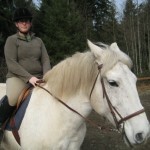 She has had two months of training, and has been ridden Western, English, and on trails. 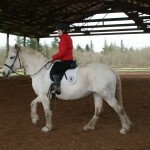 She’s great under saddle, but does need a confident handler on the ground. 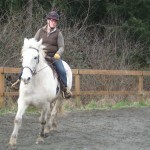 Charmeon is coming along well in her training and is much better about steering. She starts out very forward but runs out of steam quickly as she’s not very fit, but she remains very level‐headed, sweet, and easy to work with. She’s a powerful mover and a fun ride! I brushed her tail out and banged it and it looks so cute. 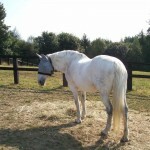 We have had quite a bit of interest in her as well, it’s easy to see why, she’s a beautiful mare. Today my neighbor, Natalie, who happens to be a Grand Prix show jumper/trainer, came over and helped me work with Char for her first ride since she arrived at SAFE a week ago. 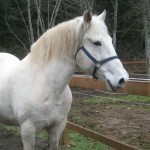 We took her out and put her in the cross‐ties, and she was very, very good for being tied, grooming, having her feet picked, saddling, bridling, all of it. 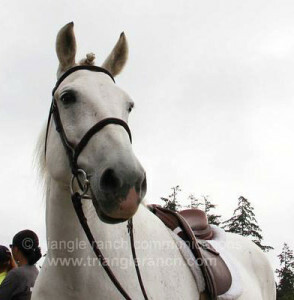 She was patient, sweet, and very good‐natured as we found a saddle that fit her (extra‐wide tree of course!) 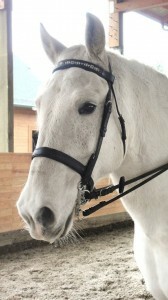 and adjusted a bridle that more or less fit her (need to get a bigger bit for her but we made do for today). Her previous trainer has put a good start on Char. 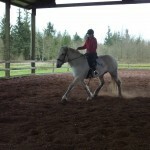 We put her on the lunge line first and she lunges very well, was responsive, forward, and willing to please. 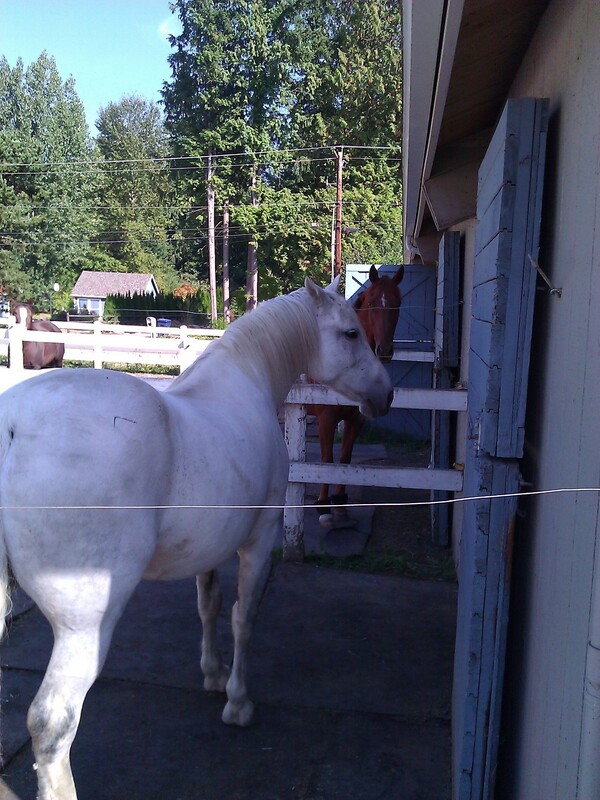 Charmeon arrived at the SAFE facility on Saturday afternoon. As part of our commitment to Char’s owner, we had placed her on a waiting list for when we had an opening for Char to come into our program, and meanwhile she had kept her in training until the end of March. 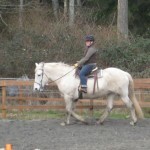 Char has apparently done extremely well with her training, and she goes English and Western, has been out on the trails alone and with another horse, and has worked on sidepassing to open gates as well. 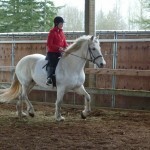 She is not for an inexperienced horse handler, because we have been told that if she gets nervous or scared on the ground that she will spin and bolt away from her handler. 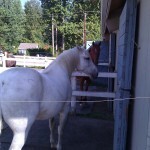 This is a relatively easy problem to fix, although a little more difficult with a horse of her size. However, some groundwork for Miss Char is definitely in order. So far she has settled in well, although she was very tired today from the trip yesterday and dozed most of the afternoon. She is eating well though, and seems relaxed in her new environment and is very sweet. 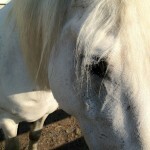 Char came with a ton of donated tack, farm supplies, supplements, and blankets. We are still sorting through it all, there was so much! 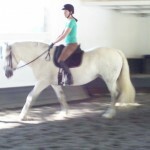 This beautiful video was sent to us from the trainer who has been working with Char. 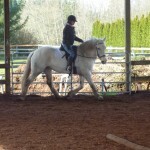 She has had about 5 rides so far (in both western and english tack) and seems to be doing an excellent job with her! 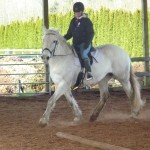 I love the music…“beautiful, beautiful”, is certainly what I think of when I see this mare in motion! And here’s some photos as well. 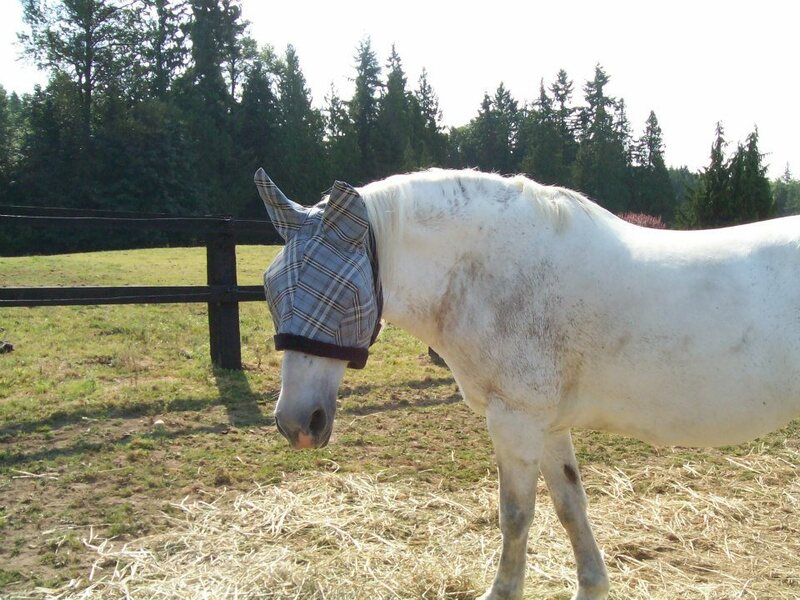 What a nice mare! 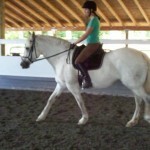 Here’s some more new photos of Charmeon, taken by the trainer that is working with her. 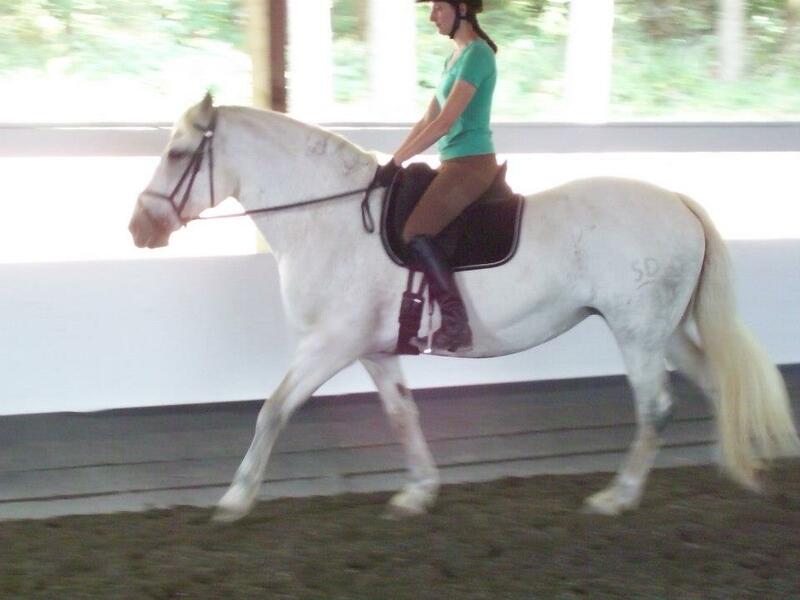 Charmeon’s owner has hired a trainer to start her under saddle. She sent us this photo. Looks like she is doing well! Also, I double checked her height as she looks much taller than 15h in the photo. She is 16 hands and 1800 lbs! 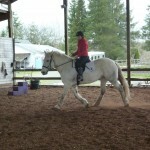 Charmeon has had some training now and lightly started under saddle but still needs more. 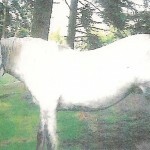 The owner has since lost her home and sold her furniture to pay for board and training for her two horses. 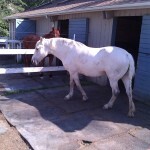 This is a nice mare that still has a lot of potential! 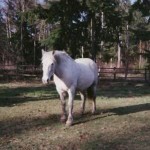 Charmeon is a 13 year old Percheron cross mare, gray, 15 hands and approx. 1400 lbs. 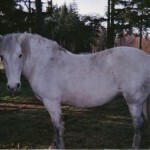 Her owner has lost her job and is unable to care for her two horses any more and desperately needs to find Charmeon a home. 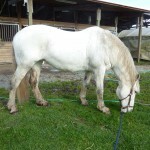 Her current owner has had Charmeon for 5 years and she purcharsed her from a PMU farm which was closing and Charmeon was going to be sent to slaughter. 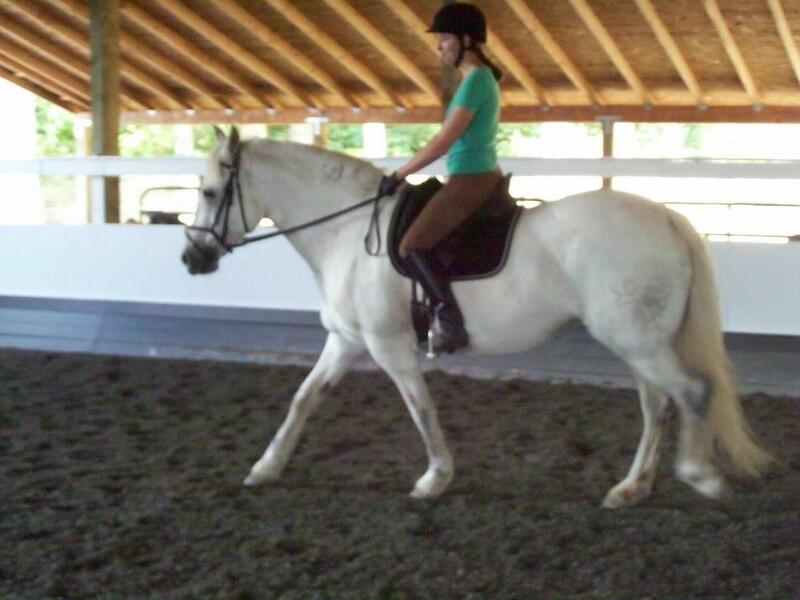 She has good conformation and a beautiful, floating trot. 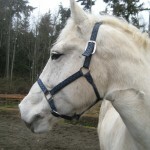 She is halter broke only, is not broke to ride but can be ridden. 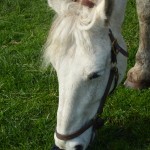 Charmeon is UTD on all routine care including vaccines, dental float September 2009, farrier care and worming.